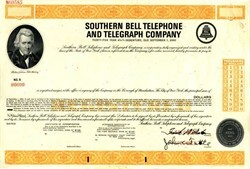 Beautifully engraved specimen bond certificate from the Southwestern Bell Telephone Company printed in 1965. This historic document was printed by the American Banknote Company and has an ornate border around it with a vignette of Andrew Jackson. This item has the printed signatures of the Company's officers. Southwestern Bell Telephone, L.P., formerly Southwestern Bell Telephone Company, is a wholly owned subsidiary of AT&T. Southwestern Bell Telephone is currently headquartered in San Antonio, TX. Southwestern Bell Telephone Company was officially founded in 1920 to take over the telephone operations of Southwestern Telegraph & Telephone Co., The Bell Telephone Company of Missouri, among others. In its time as part of the Bell System, it was at times the biggest Bell Operating Company of the 22 AT&T owned. The company was often considered the first step of the AT&T corporate "ladder" before the 1984 breakup. After the 1984 breakup of AT&T, it was allowed to keep its directory publishing operations, commonly known as "SWBYP'S" (Southwestern Bell Yellow Pages, pronounced swah-bips). Shortly after the 1984 AT&T breakup, Southwestern Bell began licensing its name to Conair, creating Southwestern Bell Freedom Phone. Conair continues to produce the Southwestern Bell Freedom Phone line of telephones. After the AT&T breakup in 1984, Southwestern Bell Telephone Company was managed by Southwestern Bell Corporation, which was ironically the smallest of all of the 7 RBOCs, as it only held 1 telephone company. Both the holding company, SBC, and Southwestern Bell Telephone often were referred to as one "Southwestern Bell". In 1995, however, SBC decided to change its corporate name to SBC Communications, Inc., a decision made to make itself a national telecommunications company. The Telecommunications Act of 1996 enabled SBC to become a national company, and SBC acquired the Pacific Telesis Group in 1997; Southern New England Telecommunications in 1998, and Ameritech in 1999.